Sniffs and Wiggles Mobile Grooming | We bring the styles to you! 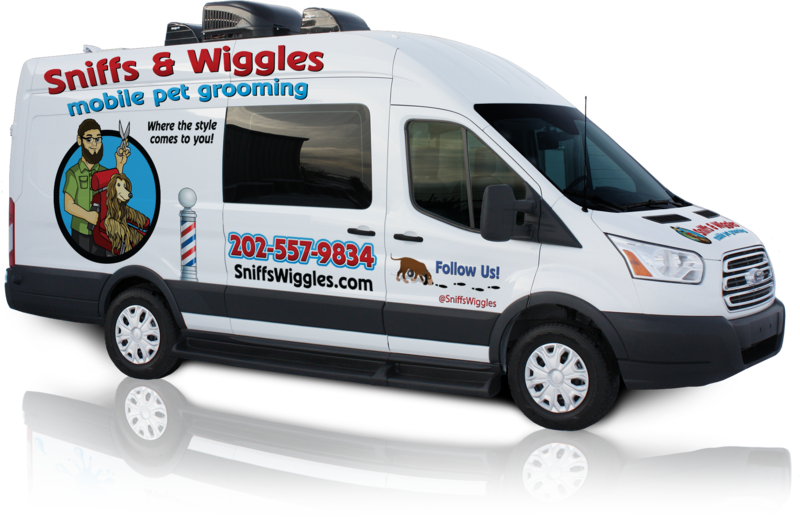 Welcome to Sniffs & Wiggles, the premier mobile dog grooming service in Washington D.C.
With our state of the art mobile grooming salon, we bring the style to you. No more double trips to the groomer, waiting in cages around other animals or a rushed groomer. Our Salon is fully self-contained, with water and power on board. We come right to your location and give your pet our undivided attention. DUE TO OUR HIGH DEMAND, we are currently scheduling grooms off a wait list. Appointments are available on a first-come-first-served basis. Please call and leave us a message to find out more. If we are grooming when you call, we will give you a howl the next chance we get. Diego is ready for a relaxing Saturday evening drink, who will join him? @rigginsrodriguez is one handsome terrier! Happy pups to brighten up this gloomy day! No appointments are scheduled on Facebook. No questions are answered on Facebook.